Jeffrey Welch's Blog: Dog Trancing — What Is It and Why Does Your Dog Do It? Also called “ghost-walking” or “weed-walking,” trancing (is that even a word?) refers to a behavior in which some dogs walk — no, creep — excruciatingly slowly, in an almost trance-like manner, usually under hanging leaves, tablecloths or clothes that lightly touch the dog’s back. But dog trancing sometimes happens just walking to the water bowl! 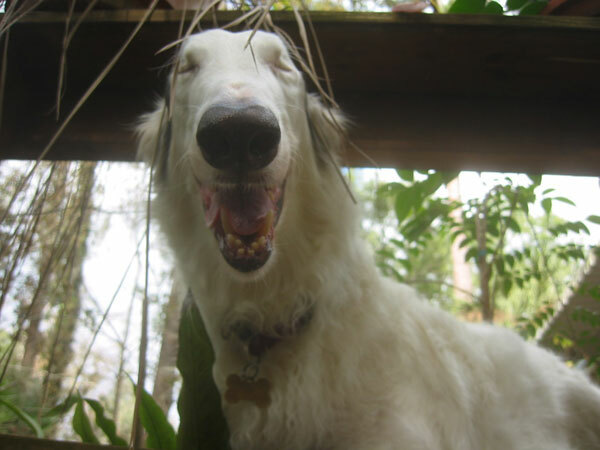 Since then, I’ve had a Saluki of my own who tranced when he walked under a particular bush in the yard. No, he wasn’t having a focal seizure, as some people who’d never seen it suggested. You could call him out of it (with effort), or interrupt him, and he’d be back to normal, although noticeably miffed at having his trance time interrupted. Trancing seems to be something the dogs that do it enjoy immensely. 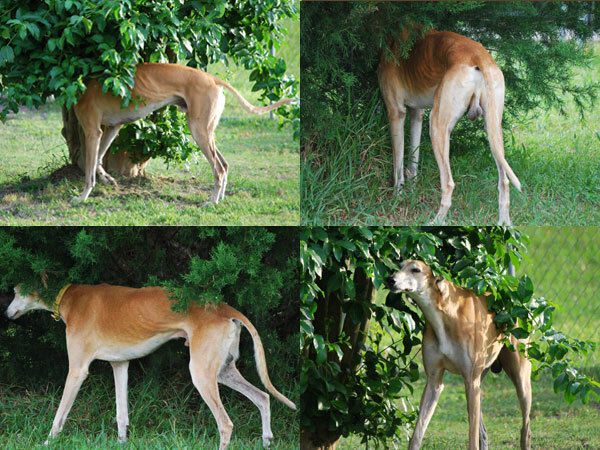 Her little male Whippet, Tigger, has watched Festus and now trances for a very short period of time under the same tree, but she has never been quick enough with the camera to capture him. It’s not the scent that appears to trigger it, as various dogs choose different types of bushes, and some prefer hanging clothes. Some even prefer odder things, but most have in common something that hangs down and scarcely touches them. Kathy Vogel, who owns the Hunt Club boarding kennel in Virginia Beach, Virginia, recalls a Saluki whose owner warned her of her dog’s odd behavior. Are certain breeds more likely to trance? Some people think certain breeds trance more than others, and it’s probably true. Greyhounds and Bull Terriers seem to head the list. But Salukis also seem to have more than their share, as do Basset Hounds. I’ve also heard of it in at least one Whippet, Jack Russell, Labrador, Irish Setter, Cane Corso, Cavalier, Australian Cattle Dog and Puggle. Back in 2004, a group of Bull Terrier owners conducted a survey to see if there was any correlation between trancing and neurological problems. They found none. Should you be concerned if your dog trances? Probably not. 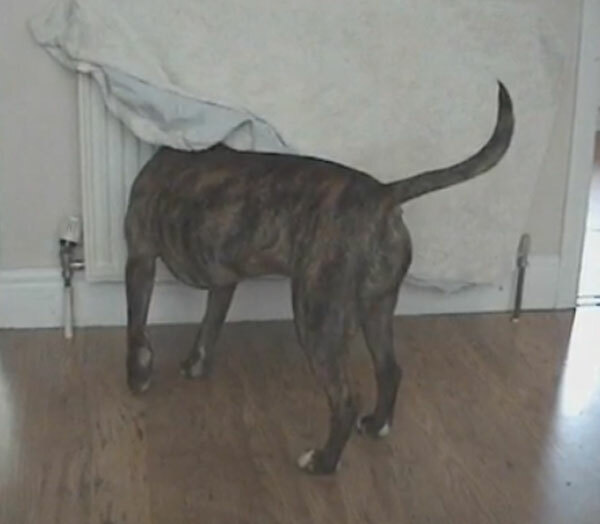 It’s not associated with known neurological disorders, doesn’t seem to be a cry for attention (as one site suggested), doesn’t seem to take over the dog’s life, and doesn’t seem to leave anyone worse off. It just seems to be something they greatly enjoy. Of course, there are always those who want to whip you into a panic. One person who asked on a pet dog forum about her Irish Setter trancing was warned not to touch him, as “bully breeds that were interrupted when trancing often attacked.” We couldn’t find even one report of such trance-attacks, but would be interested in hearing about them if they exist. But most of all, we want to know: Does your dog trance? Tell us his breed, send a link to a video, and tell us what sets him off! The post Dog Trancing — What Is It and Why Does Your Dog Do It? appeared first on Dogster.